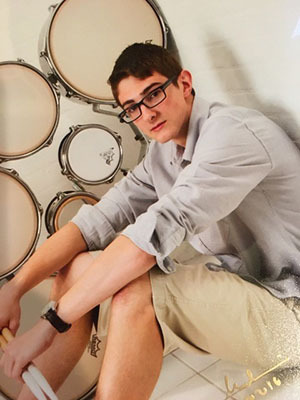 On September 30, 2017, Ryan A. McCutcheon, 19, was killed in a tragic automobile accident while returning to his college campus after a long day assisting high school drum students at a local band festival. The Rhythm19 Fund was established by his family through The Pittsburgh Foundation to keep his spirit alive through music. Ryan was an accomplished percussionist, a dedicated instructor and a mentor to high school and college students. In his senior year, he was the drum captain for North Allegheny High School Marching Band. He also led the School’s award-winning competitive indoor percussion ensemble. Following his graduation from North Allegheny, Ryan attended Robert Morris University as a business and accounting major. He remained active musically marching with Nomad Indoor Drumline, advising the drum line for the Hampton High School Marching Band and playing drums with his college friends in a rock band. He was also an active drummer at The Vault Recording Studio in Pittsburgh where he frequently played and recorded. Ryan was a bright, light-hearted, funny and loving soul. He always looked out for others and was quick to lend a hand or just be there to listen to a friend. He made a lasting impact on the people he encountered. He loved working with kids, playing music and teaching others. The mission of The Rhythm19 Fund is to honor Ryan’s memory by providing access to art and music education for children and youth. Through charitable contributions and volunteerism, the fund seeks to provide access to music for children and to use music to enrich the lives of those with challenges or special needs. The fund also seeks to strongly encourage the continuation of music programs for school children.